I will be the first to admit, I wasn’t really excited about meal planning. But, before my husband lost his job last year, that was the single act that helped me shave almost 50% off of our grocery bill…Meal Planning. Start with your Inventory Lists – I keep an inventory of everything that is in my freezer. When I sit down to meal plan, I first search out my meats on hand. Those are typically the most expensive part of my meals. 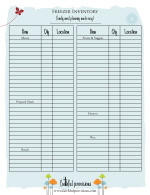 Download the Freezer Inventory List below to help you keep your freezer organized. Create a List of “Go-To” Meals – There is nothing worse than starting off with a blank slate. Having this list of meals I already have on hand helps me fill in the gaps. Plan Around the Sale Ads – In order to keep your costs for your meals down, utilize the sale ads. Plan meals around meats and produce that are on sale each week. *Checkout the Provisions iPhone App and find the lowest prices. Check your Calendar – Usually once I check my calendar, I find I don’t need to prepare 7 meals. This also helps me plan ahead to save money for dinners out. :: Visit my full page of Meal Planning tips make meal planning easier. Celery freezes well if you plan to cook with it later. The color gets kind of off and of course, it will never regain it's crispness, but if you run across a super sale and are planning on using it in soup or a casserole later on, freezing is the way to go!